Anjali Hazarika is the author of the award-winning book Daring to Dream: Cultivating Corporate Creativity Through Dreamwork published by SAGE (1998). 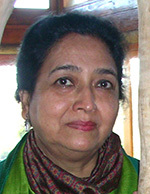 On the basis of extensive research, Anjali developed a unique program of rediscovering creativity through dreams, with a focus on developing individual/organizational creativity and innovation. This has been introduced to executives from diverse sectors and government institutions in India and around the world in Denmark, Switzerland, South Africa, the UK, and the US. She has been the Honorary Vice President (APAC) of the International Association for the Study of Dreams, USA. She has been invited for addressing the annual conferences of the International Association for the Study of Dreams the annual conference of the International Association of Process Oriented Psychology, Switzerland; and the World Congress of the International Federation of Training and Development Organizations, to name a few. Earlier with Oil India Ltd, Anjali Hazarika also served as a Founding Director of an Intercorporate Learning Network of 12 oil and gas companies in India, formed to lead and execute large-scale changes in the petroleum industry to make it globally competitive. She has edited six monographs on various burning themes related to petroleum industry. She is also the recipient of a special award for Promoting Managerial Excellence: the National Petroleum Management Programme (NPMP) Award for Excellence under the aegis of the Ministry of Petroleum and Natural Gas, Government of India. An Executive Coach in private practice, Anjali has helped in navigating the strategic leadership challenges of high-potential senior executives and board-level leaders belonging to various industry sectors. She is also an Associate Coach with the Center for Creative Leadership (APAC). Anjali is invited as an independent expert to the Steering Committee and the Advisory Council of the Center for Innovations in Public Systems, an autonomous body set up by the Government of India to identify and promote innovations in state governments through a variety of initiatives. Anjali holds a doctorate in management and two postgraduate degrees in psychology and the social sciences. Actively involved with research-based advocacy on women’s leadership issues at workplaces, she offers workshops that develop new skills and strategies for change. She co-founded the Forum for Women in Public Sector, set up under the aegis of the Standing Conference of Public Enterprises, New Delhi, and has been its President.